Important: Please follow guidance under Plastic Rearing Containers for keeping young larvae in a more confined space (or sleeved on growing foodplant) until they are large enough to be caged. Baby caterpillars placed in a cage will immediately wander from their food and starve. Please see also the SLEEVE section. A very natural and successful rearing method for larvae, and less cost than cages. 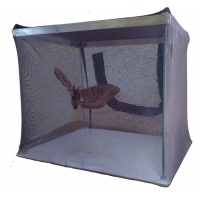 Flat-pack Cage Three sizes of wooden frame cages with netting panels, sent flat-packed and easily assembled. 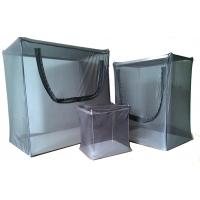 Magicage - folding 30 cm Clever design with packs flat and stands without supports. Very Large Spring-Frame cage, a real giant, that packs down to a tiny flat circle. 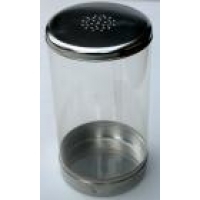 Clear sided Cylinder Cage Ideal for Stick Insects, Mantids and larvae such as ATLAS that need warm, moist conditions. Sleeves Can be used indoors, on potted plants, or cut foodplant or outside on growing plants and trees. They protect the larvae and prevent escape. A very economical and labour-saving rearing method, that often gives fresher and more natural conditions for larvae. Pyjama Cage A new concept - excellent all-round vision - packs flat - and when the cover gets dirty or damaged, slip it off and pop it in the wash to have an almost new cage again. THREE SIZES illustrated above for size comparison MINI, STANDARD and LARGE. 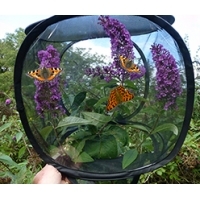 This cage design suits all uses - breeding butterflies and moths, rearing larvae, emerging pupae, keeping Stick Insects and other creatures. 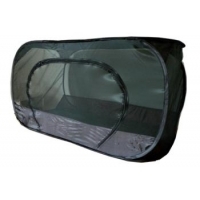 This type of cage is very suitable for laying out pupae to emerge. It is also more suitable for smaller numbers of larvae or younger larvae. Baby larvae should be first reared in plastic rearing containers or kept covered on growing food. According to size you can use these cages for pots of plant, net covered when you want to avoid straying, or cut foodplant in water. The larger cages have enormous capacity. A pre-formed frame is supported by corner uprights which join the frame to the cage base. No messing with components to make the top frame. The base of the cage is finished in smooth white paint, which can easily be washed or periodically re-painted in minutes. The supports come ready fitted with fixing nuts and washers. Quickly assembled. A zip gives easy cage access. Escape is less likely than with conventional cage doors. 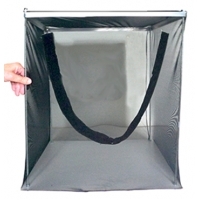 Pactical design enabling the breeder to wash, repair or replace the netting cover in minutes. Removing eggs laid in awkward places is so easy when you can slip the cover off and replace it with a fresh one - just like changing pyjamas! Keep spare covers so you can have one on and one in the wash! For winter storage, or for travel, the cage quickly packs flat. Thorough cleaning and disinfecting is so much easier than with a fixed frame cage. Pyjama cages show a substantial price saving too. TRAVEL CAGE 30cm diameter 20cm high. This cage is quite an innovation. It has been designed for convenience when travelling. It folds absolutely flat. Access is by a smiley zip in the side. In the base is another zip which allows the cage to be stood on a pot of growing foodplant, or a jar of cut food and flowers. The cage has two supports so it can be stood, but it can also be hung and used as a pairing cage. The design has evolved from needs when travelling and gathering all sorts of species to breed. Half a dozen cages occupy very little space, but they give amazing facility as a cage for pupae emerging, keeping larvae, pairing, egg-laying, butterflies or moths, Stick Insects and other creatures. The Travel Cage is very versatile! High quality wooden-framed cage, covered with strong black netting. Packed flat for easy postage and quick assembly. We will notify you if there is any surcharge for delivery outside Britain or to outlying regions. The Standard Cage is exactly as used for our own breeding. 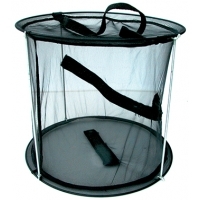 Perfect for larvae and stick insects, hatching butterflies and moths, breeding and egg-laying. 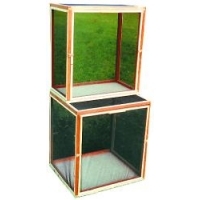 The Extra Deep Cage is for use with large moths, caterpillars or greater numbers: the extra size makes all the difference. The taller dimension on the Tall Cage is good for larger species of Stick Insect and for taller plants. 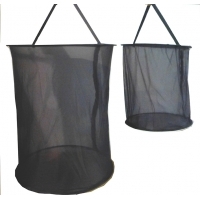 Compare prices with the Pyjama Cage range which not only save on cost and carriage but they allow instant change of netting when it gets soiled or damaged. Click on View to see all sizes illustrated.